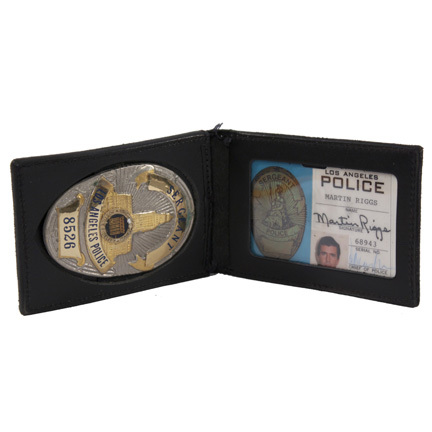 This leather badge holder with LAPD Identity Card and Sergeant’s Shield were used by the character “Martin Riggs” portrayed by actor Mel Gibson in the 1992 motion picture “Lethal Weapon 3” starring Danny Glover, Renee Russo, and Joe Pesci. 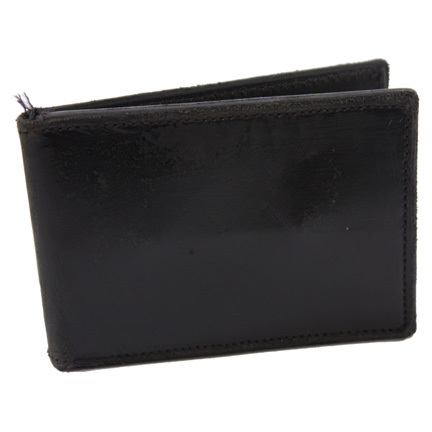 The holder is constructed of black leather with transparent ID panel and badge mounting inside. 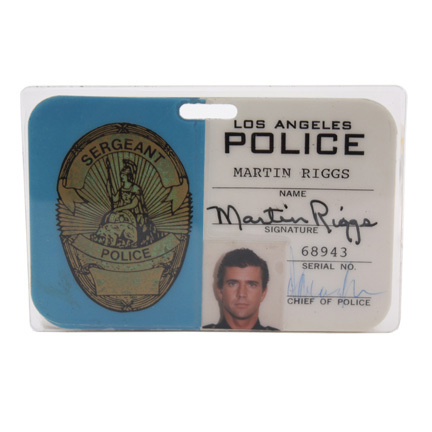 The ID is laminated with a hole at the top for use with a detachable shirt clip (not included) and reads “Los Angeles Police, Martin Riggs” with character’s signature, faux serial # 68943, actors head shot, and illegible “Chief of Police” signature at lower right corner. The gold and silver metallic “Sergeant” officer’s shield has Riggs’s badge # 8526. Gibson’s character is demoted to beat cop status early for blowing up a building in the opening sequence of the film, and later restored to his full Detective Sergeant status after he and his partner “Murtaugh” (Danny Glover) help foil a bank heist. 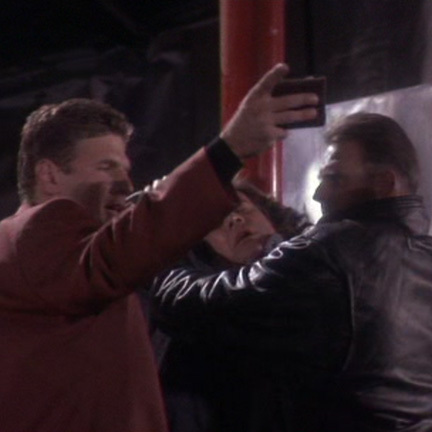 While the interior of the badge holder is not seen clearly in the final edited version of the film, the folding badge holder with contents was used in the scene where Riggs and “Lorna Cole” (Russo) investigate a warehouse where Riggs is jumped by a group of thugs. 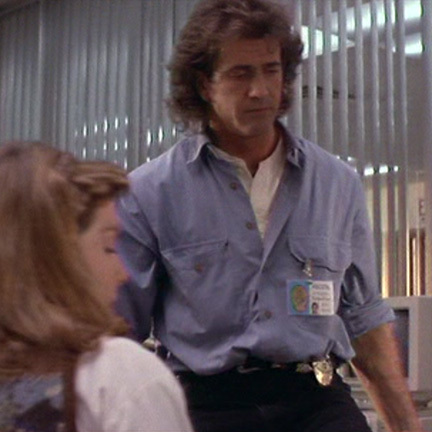 While Riggs is roughed up, one of the thugs extracts his badge holder and reads its contents to learn his identity. Lorna then surprises the group, forcing the thug to drop the holder before she is surprised in turn by another armed thug. The holder is again seen on the ground several times during the ensuing fight sequence before Riggs and Lorna escape. 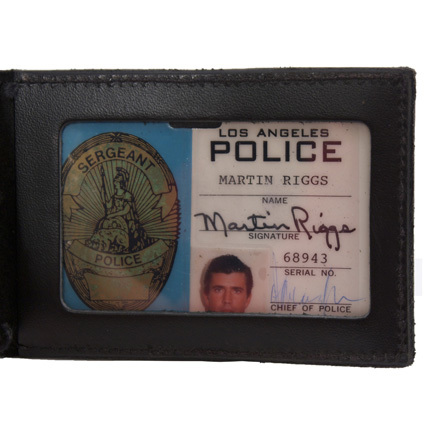 The LAPD ID card was removed and worn on a clip by Gibson’s character in multiple key scenes that took place at the LAPD Police Station. 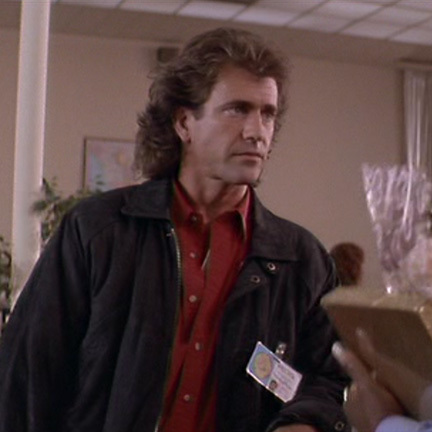 Some scenes include when Riggs tricks Lorna into following him into the station Men’s room with the hilarious line “Step into my orifice”, later when discussing their investigation inside her Internal Affairs office, and again when Riggs tricks Murtaugh into performing a spinning kick while inside the station lobby, causing him to knock over a water cooler. 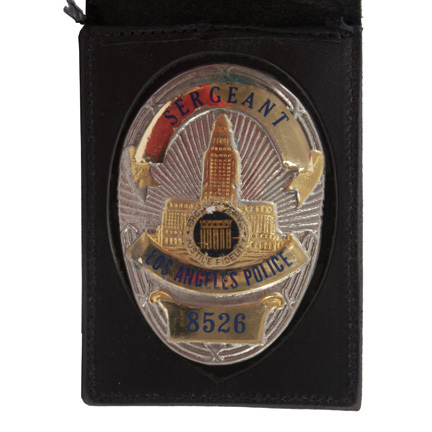 The sergeant’s badge has some evidence of distress and is missing most of the original white coloring in the center ring resulting from wear that occurred during the production. The leather holder has some minor distress from its use in the action sequence, and the ID badge is in excellent screen used condition. Accompanied by a letter of authenticity from the film’s property master who retained them after filming had been completed.